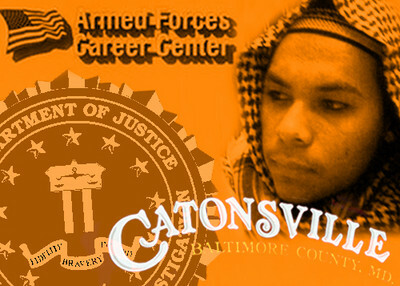 Federal officials arrested a Maryland man Wednesday and charged him with plotting to blow up an Army recruiting center near Baltimore, saying the 21-year-old Muslim convert wanted to kill as many U.S. soldiers as possible, records show. Antonio Martinez, who also goes by Muhammad Hussain, said, "we gonna hit 'em where it hurts…we are gonna go…to their stations, to their bases, to everywhere…to everywhere a soldier is," according to the criminal complaint filed in federal court in Baltimore. "Every soldier that we see in uniform will be killed on the spot, Insha' Allah." Little did Martinez know that his co-conspirator was actually an informant working with the FBI and that his plans were about to be disrupted. After weeks of investigating, officials arrested Martinez while he attempted to detonate what he believed to be a car bomb at the Armed Forces Career Center in the 5400 block of Baltimore National Pike. Martinez is a U.S. national from Nicaragua and recent convert to Islam. According to his public profile on Facebook, "I'm just a yung brotha from the wrong side of the tracks who embraced Islam." Charged in court documents with attempted use of a weapon of mass destruction, and attempted murder of federal employees, the case resembles other disrupted terrorist plots over the past three months. The similarities include the continued use of the Internet to radicalize Americans; the expanding influence of imams such as Anwar al-Awlaki and Omar Bakri Muhammad; and the FBI's sustained reliance upon informants and undercover operations to disrupt domestic terror plots. According to law enforcement officials, Martinez came to the attention of the FBI in September of this year. That month, he posted a message to his Facebook account warning "the sword is cummin the reign of oppression is about 2 cease." After weeks of attempting to recruit others to join in his jihad—three of whom declined to participate—Martinez met with an FBI informant. In numerous conversations with the informant, Martinez expressed a desire to travel to Pakistan and Afghanistan and become a mujahideen because "all he thinks about is jihad." Since he did not have the money to go overseas to fight, Martinez announced he would "make a mujahideen here, Insha' Allah, and we gonna fight against them…until they stop the oppression…fight the disbelievers until there is no more oppression and the religion is only for Allah…" The informant introduced Martinez to an FBI officer posing as an "Afghan" who would help the two construct a bomb for an attack in Maryland. "Jihad is not only in Afghanistan or Pakistan, but also in the United States," Martinez explained. As with the case in Portland, Ore., Martinez was offered multiple opportunities to back out of the plot and refused. "I don't want to talk about this no more, man. I just wanna do it…each and every Muslim in this country…knows that America is at war with Islam and they're not doing anything about it…no one is stepping up to do anything….We have to be the ones to pull that trigger. Send that message." On Dec. 8, Martinez met with the informant and the undercover FBI officer where they "armed" a bomb in the back of an SUV. Martinez then drove the bomb to the recruitment station and parked it in front of the building. He then got into the undercover officer's car and drove a safe distance, at which point Martinez attempted to detonate the bomb. He was immediately placed under arrest. Information revealed by prosecutors shows that Martinez was radicalized in a way that is becoming more and more common—through the Internet. On Nov. 3, Martinez reportedly spent time on www.RevolutionMuslim.com, a site which the Investigative Project on Terrorism reported, has take a more operational role in the global jihad. "RM functions as one of the most visible English-language websites and organization's promoting al-Qaida's call to jihad," the IPT explained at the time. "In addition to promoting the literature and videos of individuals like senior terrorist ideologue Anwar al-Awlaki, RM leaders have personally participated in all levels of the radicalization process, from identifying targets to providing advice about bombings." The day after that IPT report, Martinez was observed watching videos of bin Laden lecturers, martyrdom videos, and jihadi training films on the website. Martinez also reportedly followed the teachings of Anwar al-Awlaki and Omar Bakri Muhammad, two preachers who have consistently called for attacks on Americans. Omar Bakri Muhammad, a Muslim Brotherhood member who immigrated to England from Syria, founded Hizb-ut-Tahrir in England, and also started the banned extremist organization al-Muhajiroun. Bakri, was recently convicted in absentia by a Lebanese court for forming a terrorist group. Muhammad has said "the problem with Britain is that its law is not the law sent down by Allah." He has also justified violence against the United States, by stating, "When American bombs Sudan, Somalia, and Iraq, and sows destruction, the Muslims have the right to retaliate." Anwar al-Awlaki, an American citizen now living in hiding in Yemen, is serving as an operational commander of al-Qaida in the Arabian Peninsula (AQAP). Since arriving in Yemen in 2004 al-Awlaki has been involved in—planning, recruiting, and sanctioning—dozens of attacks against the United States. "He has involved himself in every aspect of the supply chain of terrorism—fundraising for terrorist groups, recruiting and training operatives, and planning and ordering attacks on innocents," the U.S. government explained in designating him. IPT News has reported many of Anwar al-Awlaki's terrorist connections, linking him to the Fort Hood massacre, the Christmas Day bomb plot, and the failed Times Square attack. "I love Sheikh Anwar al-Awlaki for the sake of Allah," Martinez posted to Facebook on Oct. 17. "A real insperation [sic] for the Ummah, I don't care if he is on the terrorist list! May Allah give him Kire ameen." Describing the investigation and the potential danger posed by Martinez, U.S. Attorney Rod J. Rosenstein explained, "Undercover investigations are pursued only when supervisory law enforcement agents and prosecutors conclude that there is a serious risk that cannot be ignored." In fact, while this critical law enforcement tool is frequently railed on by Islamist organizations as entrapment, as a recent report by the IPT demonstrated "undercover agents and informants are a staple in everyday law enforcement." Mohamed Osman Mohamud, the Somali-youth who attempted to set off a car bomb at Portland's tree Christmas tree lighting, pushed buttons on a cell phone in an attempt to detonate a bomb and kill thousands of civilians in Oregon. Like Martinez, Mohamud was unaware that individuals he was working with were actually FBI agents monitoring his actions who ensured that the bomb would not work. Mohamud attracted law enforcement attention in 2009 when he exchanged emails with an associate in Pakistan, hoping to travel there to prepare for violent jihad. When Mohamud's travel plans didn't pan out, the government sent in undercover agents, whose interactions with Mohamud ended in the Somali teen's attempted attack and subsequent arrest over Thanksgiving weekend. Similarly, Farooque Ahmed, the Virginia man arrested in connection with a plot to attack the Washington, D.C., subway system, was brought down through the use of undercover officers. Ahmed, a native of Pakistan who is now a U.S. citizen, first came to the FBI's attention in January when he and an unnamed associate "were inquiring about making contact with a terrorist organization in order to participate in jihad by traveling overseas to fight coalition forces in Afghanistan and/or Pakistan," FBI agent Charles Dayoub said in court documents. A trial date for Martinez has not yet been set. He faces up to life in prison if convicted of the charges against him.